A deliciously profitable way to excite seafood lovers and tempt those looking to break away from red meat. Available in 4 oz. and 6 oz. sizes, flash frozen, fully prepared and ready to cook. 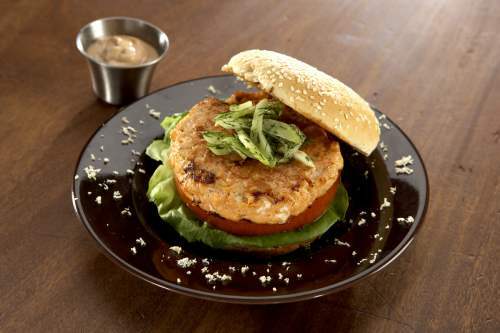 Smoky Mountain burger- Crispy bacon and fried pickles served atop Salmon Burger with coleslaw and Tennessee BBQ sauce. COOKING INSTRUCTIONS FROM FROZEN: TO GRIDDLE/FLAT GRILL: Preheat flat grill to 400°F (Medium High Heat) and cook for 6-7 minutes, turning over halfway through cooking. COOKING INSTRUCTIONS FROM FROZEN: TO CHAR GRILL: Preheat grill on high heat and lightly oil grill grates. Cook for 5-7 minutes, turning over halfway through cooking. COOKING INSTRUCTIONS FROM FROZEN: TO BAKE: Place frozen burgers on a lightly oiled sheet pan. CONVECTION OVEN: Preheat oven to 400°F and bake for 12- 16 minutes, turning over halfway through cooking. CONVENTIONAL OVEN: Preheat oven to 400°F and bake for 24-28 minutes, turning over halfway through cooking. NOTE: COOK TO AN INTERNAL TEMPERATURE OF 165°F MINIMUM.